Since Africa has opened up for Tourist, many 4 x 4 owners and nature lovers are planning to visit various destinations offered by countries north of the Limpopo. The most popular destination is Botswana, without a doubt one of Africa's last real bastions of game. A land of contrasts – from the harsh beauty of Central Kalahari to the lush woodlands of the Okavango Delta. Adventure Films recognized the need of many 4 x 4 owners for more information regarding this beautiful country. The adventurers who want to arrange their own 4 x 4 safari to Botswana are sometimes sceptical of going, due to the lack of information available regarding facilities, accommodation, road conditions and many more. For this reason, the video "The Botswana Adventure" was produced. The video is not a wildlife film. 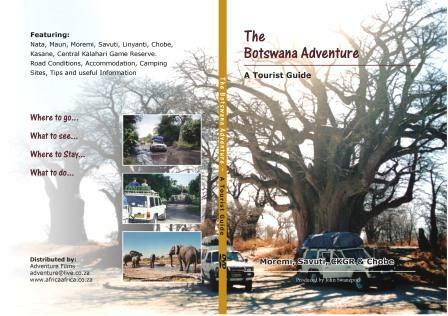 The purpose of this production is to inform potential visitors to Botswana about relative aspects that could assist them in planning their 4 x 4 adventure. Topics featured are National Parks, relevant towns, hotels and lodges, camping sites, road conditions and useful tips regarding your adventure. Our route starts at the border with South Africa and takes us to the northern part of the Central Kalahari Game Reserve (Deception Valley), from where we travel on to Maun – the Gateway to the Okavango Delta. We then headed north to Moremi, on to Savuti, Linyanti and Ihaha in the beautiful Chobe National Park. We end our adventure in the town of Kasane in the North Eastern side of Botswana close to the magnificent Victoria Water Falls.